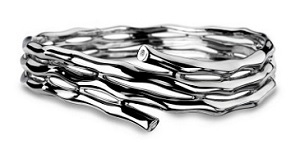 An undulating sterling silver spiral encircles the wrist to create this stunning bangle set with real diamonds. Shipping and handling is $20 within the 48 continental United States. An additional fee of $25 will apply for delivery to Hawaii, Alaska, Puerto Rico and Canada. We will be unable to accommodate deliveries to any other international destinations.